Show off your love for all things outdoors in this Muddin' t-shirt by Southern Fried Cotton. Made of 100% ring spun cotton with a soft had for maximum comfort and a perfect fit. This cozy short sleeve has a ribbed crew neck, chest pocket with brand logo, and features a graphic of an off-road vehicle about to head out muddin' on a nice day. 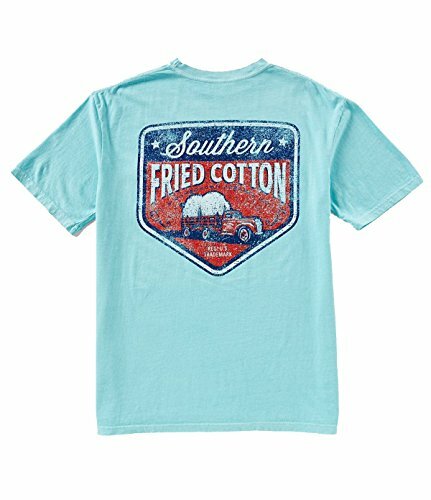 Let your youngin' show off their southern style in this 100% cotton youth Beach Party 2 short sleeve shirt by Southern Fried Cotton. These tees are pre-shrunk with the design on back and logo on front, no pocket. Our shirts are a signature of the South and the vibrant colors are perfect for any occasion. Nothing better than having a dog that loves your shoes as much as you do. Made of 100% ring spun cotton with a soft hand, this long sleeve has a ribbed crew neck and cuffs, chest pocket with brand logo, and features a printed Southern Fried Cotton graphic. Introducing our Southern States collection. Alabama Turn It Up Y'all, speaks for itself. Made off all those Bama turners. 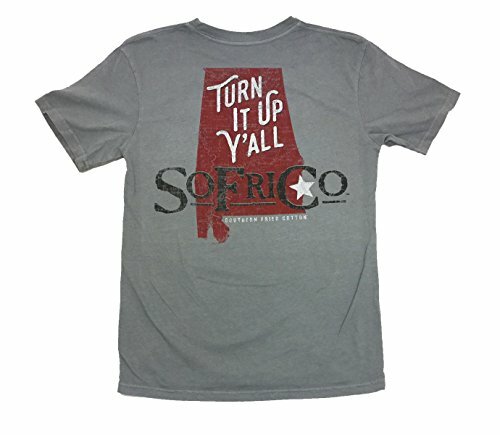 Southern Fried Cotton Alabama Turn It Up Yall short sleeve T-shirt. 100% cotton original garment dye. Pre-shrunk and ring-spun ribbed crew neckline long-sleeved chest pocket with brand logo Graphic and a top quality SFC graphic on back. Perfect for being outdoors, running errands, or spending a casual and comfortable day with friends and loved ones. 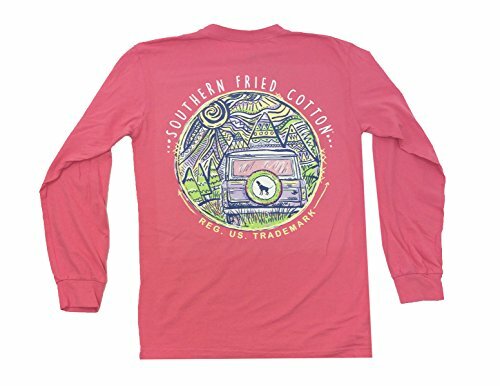 Southern Fried Cotton Mountain Weekend adult long sleeve t-shirt. 100% cotton original garment dye. Pre-shrunk and ring-spun ribbed crew neckline long-sleeved chest pocket with brand logo graphic and a top quality SFC graphic on back showing a circular mountain weekend graphic complete with sunshine, trees, and a sport utility vehicle with a howling hound tire cover. Perfect for showing anyone's love of outdoors while running errands, vacationing, or spending a casual and comfortable day with friends and loved ones. Ready. Set. Point. This tee is perfect for anyone who owns a hunting dog or just loves hunting with their pup. 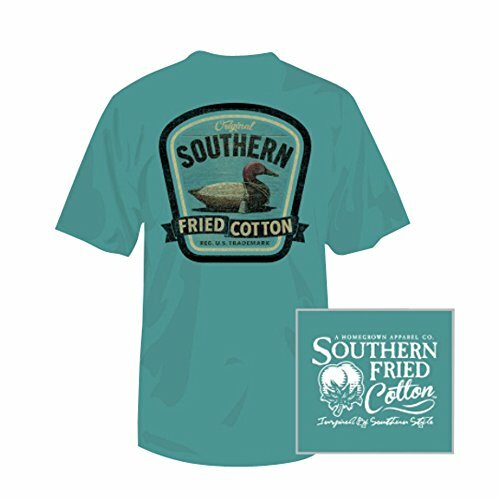 Southern Fried Cotton Point the Way adult short sleeve t-shirt. 100% cotton original garment dye. 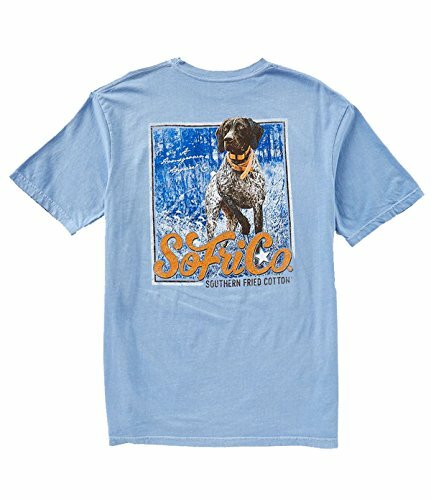 Pre-shrunk and ring-spun ribbed crew neckline short-sleeved chest pocket with brand logo graphic and a top quality SFC graphic on back featuring a hunting dog in the woods. 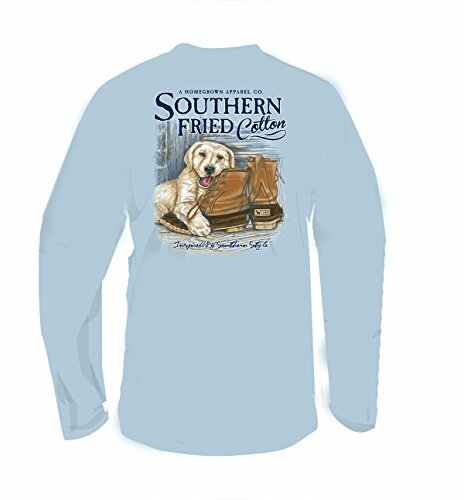 Show of your love for puppies and southern style in this tee by Southern Fried Cotton. Made of 100% ring spun cotton with a soft hand, this long sleeve has a ribbed crew neck, chest pocket with brand logo, and features a printed graphic on the back. Being a graphic design and screen printing company for more than 25 years, we've designed a countless number of t shirts for other people, helping them tell their stories. Back in 2012, we decided that our own stories based on our own roots were worth telling. We wanted to create a brand that could capture the Southern Fried lifestyle that we grew up with and still live today. Each of the 3 owners were raised in the Upstate of South Carolina, where there were frequent trips to the coast, plenty of weekends on the lake, and lots of time spent on dirt roads and back woods with either a dog or a gun...or both. When you force all those stories together and make them collide, it's a mixed up, mashed up, perfect mess of goodness. We're smashing country with coastal, sand with dirt, prep with grit, and vintage with new. 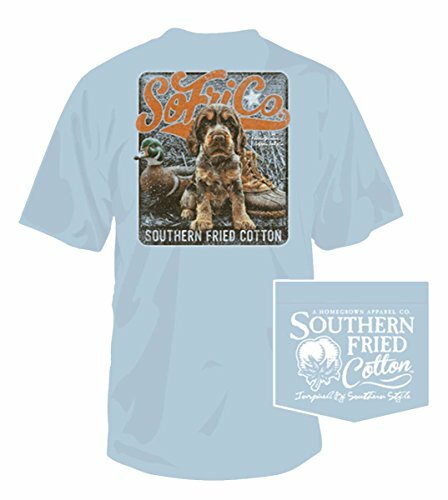 Some of our designs reflect good ole days while others are timeless that all ages can appreciate...regardless, they're all Southern Fried! 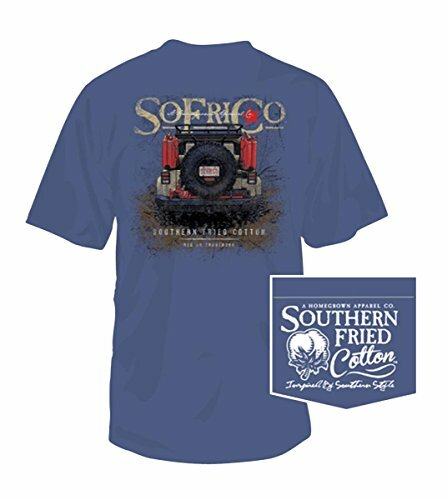 Celebrate your southern pride and your country with this great design from Southern Fried Cotton. 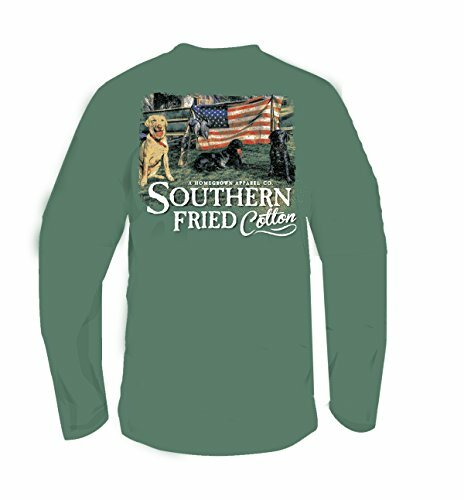 Made of 100% ring spun cotton with a soft hand, this long sleeve has a ribbed crew neck and cuffs, chest pocket with brand logo, and features a printed Southern Fried Cotton graphic. Preppy T-Shirt Collection -Simply Southern, Southern Fried Cotton, & etc. 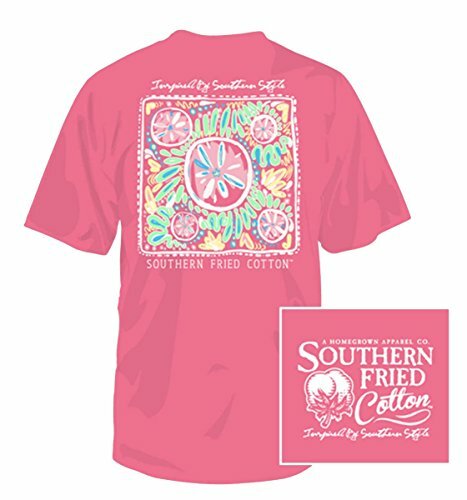 Compare prices on Southern Fried Cotton Tshirts at ShoppinGent.com – use promo codes and coupons for best offers and deals. Start smart buying with ShoppinGent.com right now and choose your golden price on every purchase.